I know that you want to get healthy this year, because it’s the most popular New Year’s resolution. Plenty of people want to help you, too, with everything from diet tips to exercise suggestions. They’ll tell you to make some lifestyle changes, to download a new app, or even to buy a wearable fitness tracker (those probably don’t work, by the way). But with lots of advice floating around, there are bound to be bad suggestions—those rooted in confirmation bias, trendiness, and pretty much anything except scientific evidence. If actually want to get into shape, and not just blow some money on a new fad because your friend told you to, a National Institutes of Health tip sheet recommends taking up a new fitness routine, doing a better job monitoring your food intake, and talking to a trained medical professional about preexisting conditions that might be contributing to your poor health. But avoid the supposedly healthy treatments listed below. At best, most of them will have the added benefit of the placebo affect. At worst, some could cause harm. When it comes to vitamin and probiotic supplements, you don’t need to take them if you’re eating a balanced diet. “I mean, certainly there can be associations between vitamin deficiency and illness,” said Shira Doron, Associate Hospital Epidemiologist at Tufts Medical Center. “But there’s a big difference between someone being vitamin deficient, either because of an underlying medical condition or an abnormally poor diet, and the need for a multivitamin supplement for general health.” In other words, if think you might have a vitamin deficiency (or if you’re pregnant, which can cause vitamin deficiency), call your doctor, who might prescribe you a supplement. But if you’re already generally healthy, you’re not going to be extra healthy by chugging “wellness” pills. And sure, some supplements might have benefits, but the evidence simply isn’t there yet. “I think that the issue with supplements for general wellness is the difficulty in doing the appropriate studies,” said Doron. “That’s a really difficult concept to define, first of all—how does a well person look as opposed to an unwell person?” Until studies come out clearly demonstrating the effectiveness of vitamins or probiotics, the best thing you can do for general health is to simply eat a healthier diet. Don’t know where to start? Try eating more plants and fewer twinkies. Tell me, do you know what a toxin is? When you move to some juice-only diet, are you actually flushing bad things from your body? “‘Toxins’ is not a scientific word when people talk about juice cleanses,” said Doron. “Toxins, when we use them in medical terms, mean something very different and they are not something removed by either juice or ‘flossing the intestines.’” Toxins, are, by definition, poisons made biologically. Like venom. Drinking lots of juice won’t flush them from your body. If you want to boost your immune system or just “detox,” you should eat healthy, sleep well and maintain a reduced stress level, said Doron. And if you want to avoid infection, wash your hands. While not really a diet fad, you might also get sick soon, and when you do you’ll probably turn to your trusty citrus-flavored Vitamin C chews and eat them as if they were Smarties candy. That won’t really do anything. Your body absorbs most of the vitamin C if you eat 30–180 mg per day of the stuff, according to a National Institute of Health Office of Dietary Supplements fact sheet. However, at doses above 1000 mg per day, your body absorbs less than half of it and pees the rest out. Consuming more than a 1250 mg per day will only increase the level of vitamin C in your blood to a level twice as high as consuming 200 mg per day. And the Mayo Clinic recommended a vitamin C intake of 65 to 90 milligrams per day from fruits and vegetables like oranges, broccoli and peppers. So more simply, for those in the back: you 👏 pee 👏 most👏 of 👏 your 👏 vitamin 👏 C 👏 megadose 👏 out 👏. As for colds, the evidence that increasing your vitamin C dose can prevent the common cold is inconsistent, said Doron. “Overall, there seems to be little to no benefit. 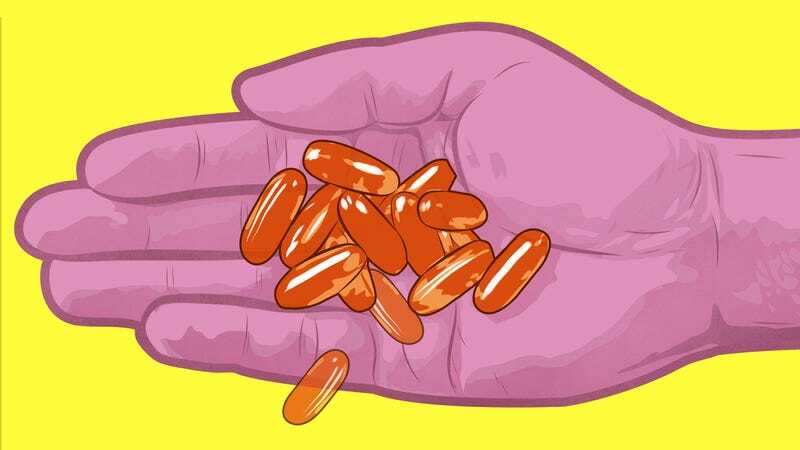 Large doses taken regularly may shorten the duration of symptoms if a cold develops, and may be helpful in patients who engage in very high intensity exercise in cold climates.” But experimenting with giant doses of the stuff is a gamble, too. “In particular, the risk of kidney stones increases with the use of vitamin C supplements,” said Doron. The one area in which taking excessive doses out vitamin C may help is in reducing your risk of urinary tract infections. “Large amounts of vitamin C limit the growth of some bacteria by acidifying the urine,” a Johns Hopkins Medicine fact sheet on UTIs reads. “Vitamin C supplements have the same effect.” But in practice, the link between Vitamin C and a reduced risk of UTIs is not well established. “Strong clinical evidence to support this claim in healthy adult women is lacking,” according to a review article published in Reviews of Urology. Gluten is set of proteins in wheat that blesses bread with its spongy breadiness. Humans have been eating gluten for literally thousands of years. But today, a third of Americans avoid gluten for various reasons. Several million Americans suffer from celiac disease, which messes with the small intestine’s physical ability to absorb nutrients. Several million more suffer from non-celiac wheat sensitivity (wheat, not gluten), facing some of the same symptoms as celiac disease sufferers—though scientists aren’t sure if gluten is the specific cause. But this only makes up two percent of the American population, which means that odds are that gluten is not causing your dietary troubles. Basically, you’re probably avoiding a personal health issue that you should see a professional about if certain foods give you gastrointestinal distress. And if bread doesn’t give you celiac symptoms like diarrhea, vomiting, fatigue and weight loss, then you’re likely wasting your time and resources by giving it up. But yes, more folks seem to be suffering from wheat-related disorders these days, according to a report from TIME, which explains how this trend might be related to an increased intake of processed foods. So, again, if you have diarrhea every time you slam a scone, call your doctor. CoolSculpting is the process by which you go into a clinic, someone attaches a freezer pad to your body, you fat freezes off, and you poop or pee it out. The FDA-approved procedure seems to work, but it’s not for obese people. Instead, the procedure serves as a way for already-skinny (and wealthy) people to freeze off a tiny bit of fat around their bellies and love handles for a $400 to $1800 price tag. Tiny, as we’ve reported, meaning around 40 cubic centimeters, compared to 450 cubic centimeters in a pound of fat. More people are happy with the procedure according to feedback on the cosmetic surgery community site RealSelf than when we first reported this story. But if you live a sedentary lifestyle and don’t eat a healthy diet, the fat will come right back. Maybe make diet and exercise your New Year’s resolution and get yourself a painful, expensive fat-freeze as a gift at the end. Even those more cautious about completely writing off other workout fads like cupping and toning shoes couldn’t support waist trainers. “I’m very much a proponent of creating internal core strength and core stability,” said Dixie Stanforth, Senior Lecturer in the Department of Kinesiology and Health Education at the University of Texas at Austin, “but an external passive restraint is not where I would want to head with my client.” Basically, by using the waist trainer, you’re holding yourself up using the corset, rather than with your own strength. Instead, Stanforth simply recommended better vertical core training while at the gym. Again, waist trainers are corsets. “We’ve been through this. It was the 1800s,” said Zimmerman. “When people wear them for a long period of time, it might remodel the bones a little bit which may or may not be very hazardous.” Not only can corsets cause breathing troubles, but they can break ribs or crush organs, Christopher Ochner, Ph.D., weight loss and nutrition expert at Mount Sinai Hospital, told Marie Claire last year. People are trying all sorts of superfoods for supposed health benefits, like kale, watercress and quinoa. But what about placenta? Some folks eat their own placentas after giving birth to offset the effects of postpartum depression. Your Doctor Probably Has A DNR. Here&apos;s Why You Should Consider One, Too.